Xavier Garza has taken over three of South Texas College’s campuses, the campuses’ library art galleries that is, with his new art exhibition, “Xavier Garza: A Three-Part Retrospective.” The celebrated Rio Grande Valley native artist, children’s book author and illustrator is currently displaying his latest works in three parts at the college’s Technology and Nursing and Allied Health campuses in McAllen and Starr County Campus in Rio Grande City. His work will be on view at all three locations through May 13, 2011. An art and book talk with Garza will take place on Thursday, April 14 from 2:30 to 3:30 p.m. at STC’s Starr County Campus Library located at 142 FM 3167 in Rio Grande City. Admission to all exhibits and events is free and open to the public. Garza grew up in Rio Grande City, but today resides in San Antonio. He uses his experiences as a child and the folktales and stories he heard growing up as the basis for his books and drawings. 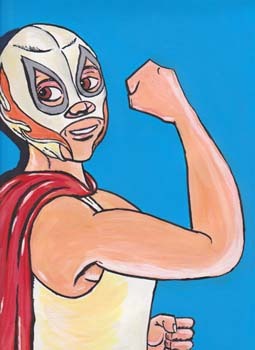 Garza’s three art exhibits at STC feature many of his paintings, drawings and illustrations of famed and mythical Mexican luchadores, masked professional wrestlers, to Hispanic folklore tales such as La Llorona and others. He is the author and illustrator of seven books including “Lucha Libre: The Man in the Silver Mask- A Biligual Cuento,” “Juan and the Chupacabras/Juan y el Chupacabras,” and “Charro Claus and the Tejas Kid.” His latest book, “Maximillian and the Mystery of the Guardian Angel,” will be released this spring by Cinco Punto Press. Garza earned his Bachelor of Fine Arts in Studio Art from The University of Texas-Pan American and his Master of Arts in Art History from The University of Texas-San Antonio. His artwork has been exhibited at venues such as the Arizona State Museum, The Mesa Southwest Museum and The Institute of Texan Cultures in San Antonio, to name a few. STC’s Nursing and Allied Health Campus Library is located at 1101 E. Vermont in McAllen and the college’s Technology Campus Library is located at 3700 W. Military Hwy. in McAllen. The college’s Library Art Gallery Program exhibits regional, national and international artwork, explores new visions and theories of creativity, and introduces innovative artistic expressions to the South Texas region. For more information contact Sofia K. Vestweber at 956-872-3488 or at libraryart@southtexascollege.edu, or visit http://lag.southtexascollege.edu. “Maximillian and the Mystery of the Guardian Angel,” an acrylic on canvas painting by Xavier Garza.